See how LogViewPlus can help you get the most out of your log files. LogViewPlus can parse log files written in a variety of different formats. This demo introduces the Parser Wizard. Learn more about how LogViewPlus accesses files. A quick introduction to using LogViewPlus to tail and grep a log file. 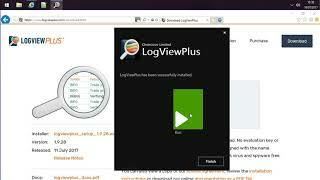 You can install LogViewPlus and start analyzing at your log files in under a minute. Struggling with 1 GB log files in Notepad? Opening large log files in LogViewPlus is fast and easy.